Kudos to Linear Tube Audio’s Mark Schneider for continuing to market David Berning’s amplifier designs. Berning’s patented ZOTL circuit obviates the need for a conventional audio transformer to couple the tube output stage to the loudspeaker. In this regard, the ZOTL amplifiers can be considered output-tranformerless (OTL) designs. The ZOTL40 power amplifier was commissioned and licensed directly from Berning and is proudly hand-built with premium components in Washington, D.C. It should be noted that the Mk. II version reviewed here represents an advance over the original product. 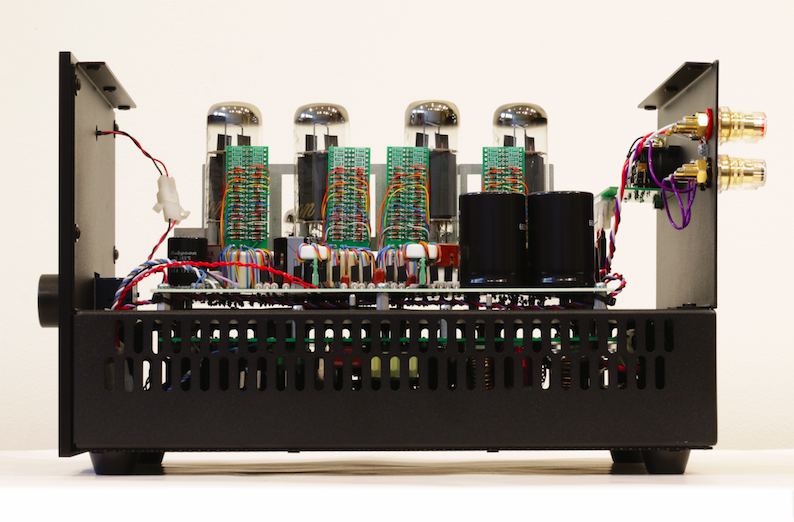 It is now shipped with Russian reissue Genalex KT77 beam power and preamp tubes and includes a few other component changes as well (see Tech Talk sidebar). The front panel is adorned with a volume control, a Japanese ALPS Blue Velvet pot. On the back panel one set of RCA inputs is connected to this control. The other two sets of inputs, (XLR and RCA) bypass the volume control, though it should be mentioned that the XLR jack is also wired single-ended with pin 2 hot. Prioritizing the amp for direct input is perfectly fine with me. The ALPS pot is OK sonically, but is outclassed by a high-quality volume control such as my Experience Music autoformer. The latter allowed the ZOTL40 to sing with remarkably smooth and grainless textures. In fact, it didn’t take me long to realize that this was the smoothest-sounding ZOTL design I’ve auditioned to date. A new feature is the mono-stereo switch on the back panel. It allows for mono operation with the left and right channels bridged together. (See the owner’s manual for detailed instructions.) Power output almost doubles in mono operation, but of course in that case you would need another ZOTL40 for a stereo hookup. The input voltage gain stage consists of a 12AX7 connected as a differential input. It is followed by a 12AU7 dual-triode configured as a phase-splitter. The push-pull output stage is operated in Class AB and is biased by an autobias circuit. Hence, there are no bias pots to fiddle with. This amp is plug-and-play. Tube high voltage is delayed after the amp is powered on and the heaters are warming up. Don’t be surprised by an occasional burst of static when the high-voltage ramps up; it’s perfectly normal and only lasts a few seconds. I’m not sure if the stock Russian reissue Genalex Gold Lion KT77 is an exact copy of the original design, but sonically it’s a different animal. Since I’m fortunate enough to have on hand a stash of vintage British KT77s, I was able to roll them in and concluded after a couple of listening tests that they are superior to the Russian versions, which lacked the textural sweetness and smoothness of a vintage KT77. Not to worry, another good option is the Russian reissue Mullard EL34, which perfectly captures the classic warmth of EL34 pentode sound. I’ve recently spent quality time with the Audio Research D70 Mk. 2 stereo amp, in my estimation one of the great amps from the 1980s, and one that embodies that classic ARC “high definition” sound. The D70’s warm and vivid midrange coupled with an expansive soundstage definitely push most of my buttons. It serves as a reminder of the sort of tube sound pretty much forgotten by modern designers. No, it isn’t perfect at the frequency extremes, and resolution of low-level detail isn’t on par with current designs, but it reaffirms why I signed up for tube amplification so many years ago. Now imagine the ZOTL40 displacing the ARC in my reference system and guess what happened? In a nutshell, midrange coloration vanished, transient resolution improved, the treble range opened up, and bass line precision kicked in. Over the past decade or so I’ve been addicted to collecting vintage turntables, mainly linear-tracking types. By a recent count my collection stands at eight tables. After experimenting with several analog front ends, there was no doubt in my mind that the ZOTL40 was a model of tonal neutrality, a rare happening amongst tube amplifiers. That’s not to say that it always sounded neutral. It basically took on the colorations of whatever I threw at it, much like a sonic chameleon. It never masked the character of any front-end component.